In previous posts on Portability I’ve covered what I don’t like or don’t any more use. 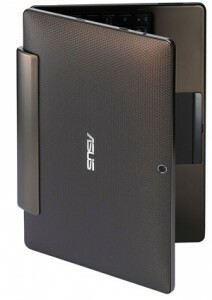 This time we’ll look at something I actually do like, the Asus Transformer Android tablet. Actually I more than like this thing, I’m pretty much permanently glued to it. Without doubt it’s the best piece of technology I have used so far for portable connectivity. It’s not yet the best there could be, but you can see how it could get there at some point. This is not going to be a full review of the product. Many of these exist around the web, and I wouldn’t disagree with most of them (here is one of the best). But not many of them deal with what the thing is actually like to use – most reviews are lists of what’s included and not included, with a fast summary at the end. In the next couple of posts I’ll cover what I actually do with it, and how it works in a practical context, covering both benefits and limitations. As ever, this is not intended to be definitive. Many readers of this log will be surprised to hear that I am somewhat obsessive, if not geeky, and am often unnecessarily concerned with the technical. So what I consider useful or interesting, or even tolerable may not be of any interest or relevance to others. Take from the post what you want, and if the product interests you, then take this write-up as one reference-point, not the final word (i.e. don’t blame me if you don’t like it). I’ll come back to this point, but the existence of these tablets begs the question of what they are for. 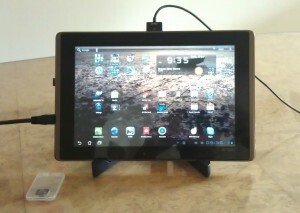 In my view, at the moment, they are unsurpassed as viewing devices. There is almost nothing to touch the book, manual, or newspaper reading experience on a tablet, and they are pretty good for most browsing, and for reading email. These are generally passive activities. On the writing or active side, they are a lot less effective. 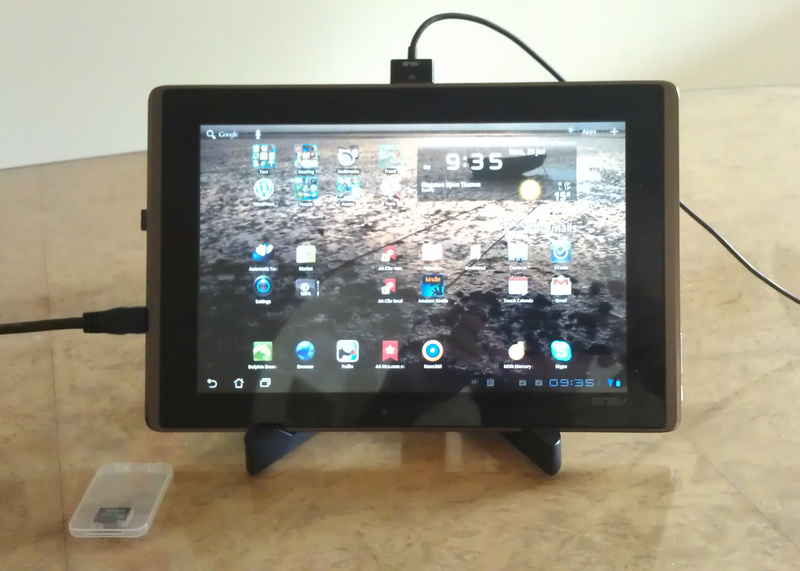 I think the Asus goes a long way to starting to solve some of the problems of creating stuff on a tablet. But tablets are still a long long way from being a PC or even a netbook substittute. There is quite a lot to cover, so I will start with the hardware. And in this area, I think Asus have done a really splendid job. As you can see in the photo to the left, it is a rather muted industrial design. The 10.1″, 16:9 screen has 1280 x 800 pixels, more than my 10″ Samsung NC10 Netbook,and the same as my 12″ Toshiba R500 laptop (of which more later). It uses in-plane switching, the screen technology used in the iPad, and it’s every bit as good – in fact I would say better having looked at them side by side (the iPad has 1024 x 768 pixels in a 9.7″ 4:3 display). The screen is very bright, and can be used outside as long as it’s in the shade. Like the iPad it has a scratch-resistant screen that is able to take repeated greasy finger swipes. The bezel of the screen is glossy black, and the casing is an attractive gunmetal brown. It’s very solid, but around the same weight as the iPad. From the side, it’s a mite thicker, but very easy to hold, and nicely balanced. The ARM 9-based processor is made by NVIDIA, well known for graphics cards and now charging aggressively into the mobile phone and tablet space ahead of Intel. It contains a dual core ARM-9 1GHz cpu, plus a graphics processor unit capable of 3D, and full HD rendering. This is a higher spec than my Samsung NC10 netbook, and it is certainly very responsive – far faster than my PC at rendering web pages. The stock Google Chrome browser is also fast, and scrolls as smoothly as Safari on the iPad. Other Android browsers are not as smooth, but they bring many benefits that make up for that. 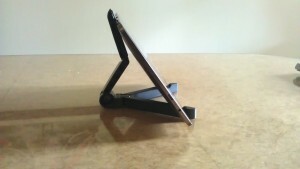 The very slim profile of the Transformer is shown here on a folding stand, something I’ll come back to, but which I think is an essential accessory for reading. The battery life of the unit is around 10 hours, but that of course depends on usage. I have never found myself in a position where I was out of battery without a nearby power supply, so it’s quite enough for me. One of the downsides of the device ( at the moment) is that it uses a unique sync/charging cable, rather short, and spares are not available in the UK from any source including ASUS. However, it is available in the US, so should be over here in a few weeks, solving a key issue. 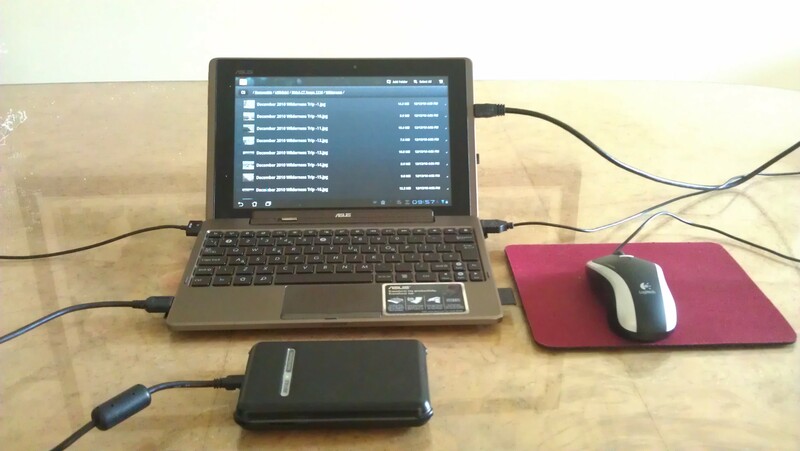 A tip here: the sync/charging cable uses USB3 pins, so to extend its length, use a USB3 extension cable. Where the Transformer starts to differentiate itself is in connectivity and attachments. This next shot shows the base unit fully loaded. On the left you can see the extremely handy mini HDMI out socket. This is a unit designed for video playback, so when you arrive in a hotel room, hook the HDMI cable up and play your movies full size. Just above it on the left, you can see a small protrusion – which is actually the unplugged micro SD card. I have a 32 GB card in my system which cost me £35, or around $50. To get an extra 16GB in an iPad2 costs as much as £80. The iPad2 does not offer either an extra micro SD slot, or an HDMI out port by the way. At the top you see the charging/sync cable btw. Where the Transformer gets it’s name and it’s real differentiation is the clip-on keyboard, more properly titled ‘the dock’. This is a beautifully engineered item. The core of this unit is a very nice keyboard, with custom Android function keys and an excellent trackpad. This transforms text entry and navigation on the tablet – I’ll describe some of the benefits and limitations of soft versus hard text entry in the next post. The dock unit also smuggles in a full-sized battery which doubles the overall life to around 20 hours (who needs that long? I’ve never been remotely interested in testing this). But critically, what it also does, absolutely uniquely, is add two full USB ports and another full SD card slot. 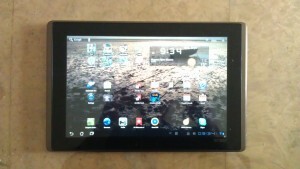 Now you are pretty much in loaded Netbook territory, and light years away from what the iPad2 can offer. 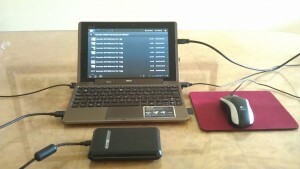 In the photo above, you can see my portable 500GB (bus powered!) USB drive attached in on the left (fully working! ), a Logitech USB mouse on the right (fully working! ), and an SD card protruding just next to that (fully working!). I mean bl**dy hell. Is that brilliant or what? Well in engineering terms it really is pretty brilliant. Good engineering these days involves the hardware and system software working smoothly, and ASUS have extended the base Honeycomb 3 Android OS (which does not natively support any of these i/o extensions) and made it robust and usable. 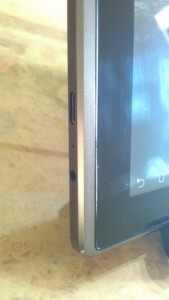 This is in marked contrast to Motorola, whose Xoom tablet included a non-functional micro SD slot. Google will be along any time now with formal inclusions of these functions in Android 3.2 and 3.3, but in the meantime, ASUS have done a superb job in showing leadership in what a tablet can do. It is of course not your Grandfather’s tablet. Your Grandfather needs an iPad2 . But if you can operate a PC, understand why and how it works, and are interested in how the future will be, then this is the tablet for you. It has problems and limitations, and it is not by any means the final device in this category. But it is absolutely excellent. And it’s not an Apple.